After a rating's smash with The Sound of Music, NBC and producers Craig Zadan and Neil Meron have announced that they will stage Peter Pan, the 1954 musical, on NBC next December. 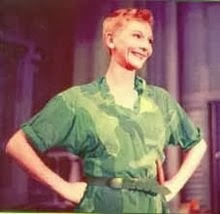 While casting is currently underway, no names have been announced to don the iconic green tights previously worn by Mary Martin. After The Sound of Music casting debacle of Carrie Underwood, here's hoping the lead in this one has some musical theater experience. Who are you hoping gets to fly into your homes? And don't you think Tony winner and The Sound of Music alum Christian Borle should play Captain Hook?